NEW. Lantern to light up 360 degrees, 100 Lumens COB bulb, in a branded gift box. NEW. 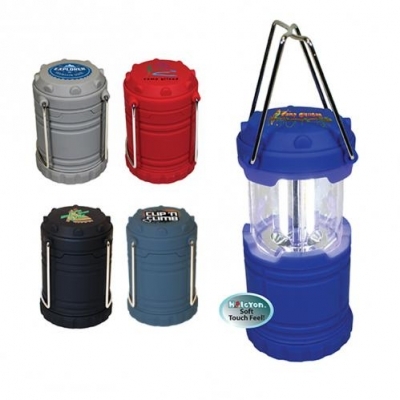 Lantern to light up 360 degrees, 100 Lumens COB bulb, in a branded gift box. Comes with your logo imprinted, and 3 AAA batteries. Just slide the top up to turn on and adjust the brightness. You may set it on a table in a power outage, to light up the room. It has convenient folding handles to hang on a hook. Great for charity walks, outdoor activities, boating, camping. Price includes your logo imprinted on the top, one standard color. Colors: Blue, Gray, Red, Black, Slate Blue. Size: 3 3/4" high. 2 1/2" diameter. Option: Imprint additional location $0.25 each piece, plus additional setup charge.